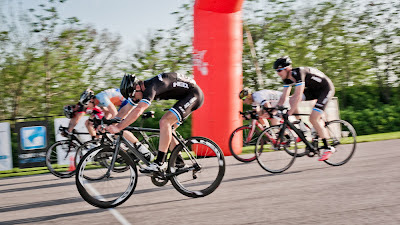 Last Thursday, with help from my teammate Jordan, I placed 3rd at the Driveway in the Category 3/4 race. The course was the grand prix loop, run counter clockwise, which I love because it puts us through the chicane immediately before the finish sprint. It makes it so there's really a pre-sprint sprint for position. 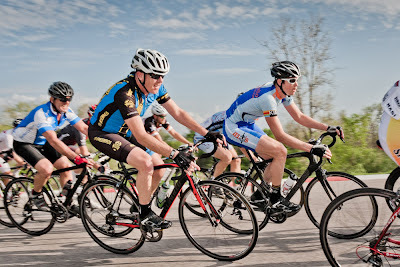 The weather was beautiful, lots of my friends were there, no one crashed, photo finish. Just a great afternoon of racing. Can you figure it out? It took us a while too. 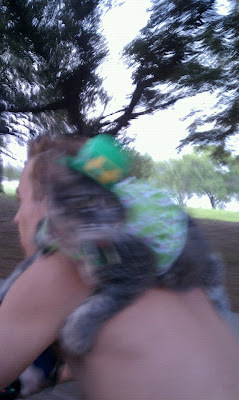 It's a cat, wearing a green neckerchief and leprechaun hat, riding on a man's shoulders, as he's riding a bike. We all pulled out our camera phones. I rode up next to him and he gave me a queer look as if to say, "What! Haven't you ever seen a leprechaun hat on a cat on a guy on a bike before?" Thinking about it later I realized that as I was starting my final lap at the driveway, leaning through the turns, this guy was tying a handsome little knot in his cat's bandana, and positioning a small hat on his furry little head, making sure that it would stay on in the wind. As I was standing up to sprint, and throwing my bike left and right over the finish line, he was picking out the perfect Irish-cat-backpack playlist and calling for his little Patrick to hop on his shoulders. And when I was taking a quick cool-down lap and finding my teammates, he and his festive cat were setting off together on an adventure we could only imagine.